alright, i was feeling a fun look for friday so today i'm rocking these amazing leggings, which are not only so comfy, but very "almost 4th of july" appropriate :) it was also very convenient that our neighbor happens to have a fantastic red barn in their back yard, which couldn't have worked out better for this look! i have been loving this chambray lately and pairing it with a lot of my summer pieces. i feel like a chambray is a classic fall piece, but because this one is so light, it's been a great addition to dress up a few of my favorite summer outfits! i'd love to hear- what are some of your favorite fall pieces that you've carried over into summer?! oh my gosh! 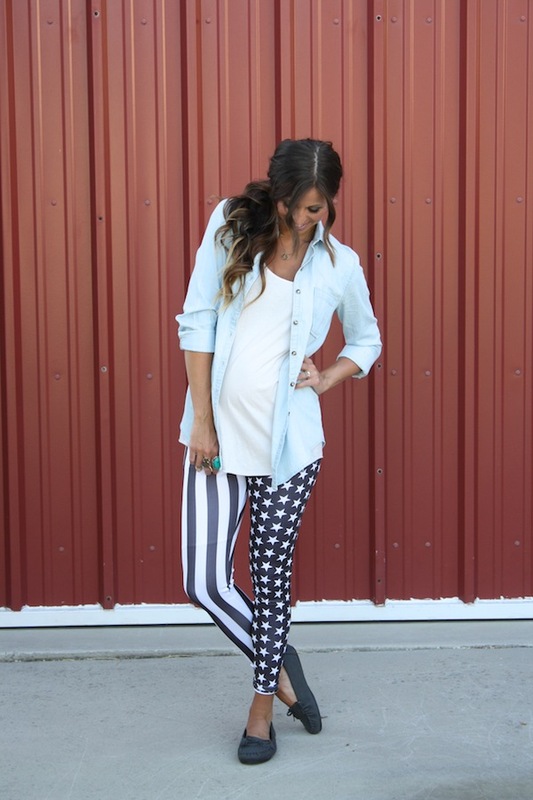 i'm in love with those leggings!! 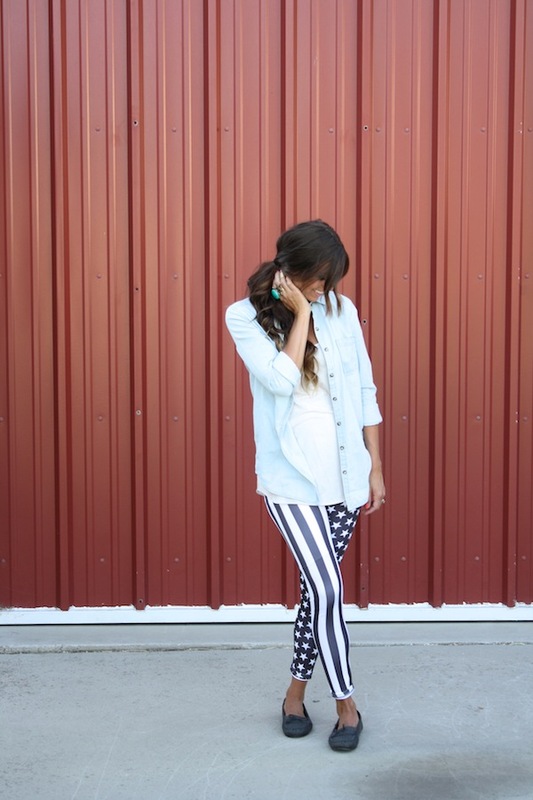 Love this simple & patriotic look! those leggings are amazing! I love they way you styled them up too! Love those leggings! I also really like how you didn't go too over the top with the flag theme and instead decided to wear a white shirt with chambray over it. 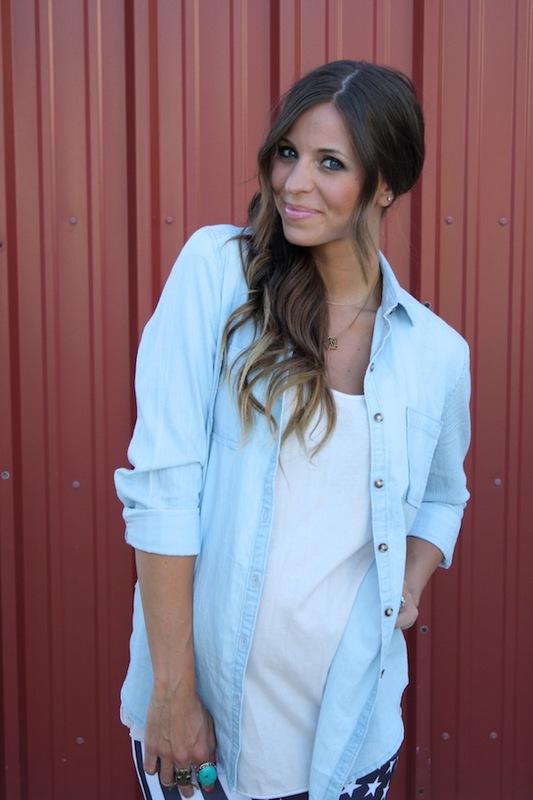 It looks great on you :) It is definitely a fun look, and I love how you brought the chambray into summer.